A Minnesota newspaper is reporting a major geographic faux pas by Sarah Palin... and in a bizarre coincidence, I witnessed it personally. No kidding. 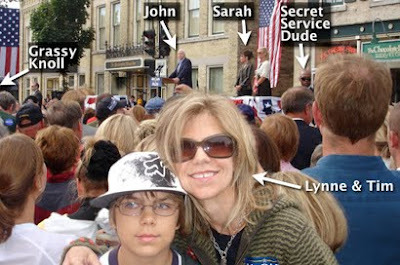 Right after winning the nomination, Palin and John McCain made their very first campaign stop in my hometown of Cedarburg, Wisconsin. My family stopped by to see what all the ruckus was about, and I snapped the photo above. Turns out that in her memoir, Sarah Palin confused tiny Cedarburg, Wisconsin with much-bigger Cedar Rapids, Iowa. Palin apologists might say that she made so many speeches, how could she keep track? But c'mon, it was her first campaign stop! She could look it up pretty easily. And Cedar Rapids is in a different state... and 10 times as big. Personally, I can't tolerate a leader who doesn't know her geography. I don't want my president confusing places that sound a lot a like... "Invade Iraq? Iran? Whatever, it's only one letter difference. You betcha." Read the article documenting her error here.